A device that makes sample interiors visible to non-destructive inspection using x-rays. This device enables non-destructive testing to gain a clear view of sample interiors. It serves all functions and covers all angles of interior inspection invisible from the outside, such as inner structures, voids, cracks, admixed foreign objects, as well as solder and the connection status between contact surfaces, etc. Many of these issues can be resolved by using the X-ray CT scanners of Seikoh Giken. By achieving clear visibility of the sample interior, our X-ray CT scanners allow users to see what they need to see. Visual check of interiors, measurement of dimensions, comparison of designs, fiber orientation analysis, analysis of defects such as voids, etc. 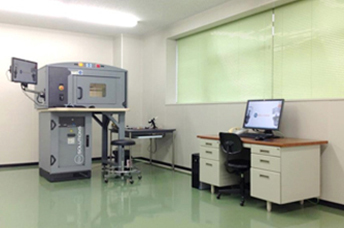 The X-ray CT scanners of Seikoh Giken are used in a diversity of applications across a wide range of industries. The X-ray CT scanners of Seikoh Giken are available for sale. We also offer non-destructive testing service using our X-ray CT scanners. Along with an analysis of requirements that we conduct together with our customers, we propose the best match with regard to equipment and inspection methods.